Last week I talked about Paul Revere’s ride to warn the colony about the imminent raid by soldiers on Concord. The week before that, I left off with Gen. age getting ready to deploy his soldiers on the evening of April 18, 1775. Today we will pick up there and follow the army along its route to Lexington and Concord. At around 10:00 PM on the evening of April 18, after the ferry out of Boston and the land exit over Boston Neck were both closed, Lt. Col. Francis Smith, per Gen. Gage’s orders, began to assemble his soldiers. Smith had only received his orders a few hours earlier and had to work quickly to collect his forces for the march. The soldiers deployed for this mission did not come from any particular regiment. In a typical regular army regiment, there were two special companies. Regimental commanders would put the largest and strongest soldiers in the company of grenadiers. Their original purpose a century earlier was to hurl large heavy grenades at the enemy. Although they no longer did that, commanders found grenadiers useful as shock troops. They were the most effective in hand to hand combat. The light infantry constituted the other elite company in each regiment. This was a relatively new innovation. These soldiers were selected for being particularly active and energetic. A regimental commander would use the light infantry as skirmishers or flanking guards to protect the main body of soldiers from snipers or other smaller attack parties. Gage decided to pull the grenadier and light infantry companies from each of his regiments, to create a single brigade of elite soldiers for this particular mission. The detachment consisted of eleven companies of grenadiers and ten companies of light infantry. The detachment also included a few companies of royal marines. This probably meant Gage had all his best fighting men on this mission. But it also meant the companies were fighting alongside other companies outside their regiment. They had not worked together before and were serving under unfamiliar regimental commanders. This could be why many of the regulars seemed more inclined to act on their own initiative during this battle, rather than strictly following the orders of their officers. Gen. Gage also decided that his soldiers would travel to Charlestown by boat, so that his soldiers could start their march from there. Admiral Graves did not supply enough boats to take all the 900 or so soldiers across the harbor in one trip. As a result, the marines had to take half in one trip, then return to take the other half. Even on two trips, the boats were so full that soldiers had to remain standing to fit everyone. On the other side, again in the interest of secrecy, the ships landed in an unused area away from Charlestown to avoid prying eyes. The reason the area was unused was that it was wet swampy land. The soldiers had to tramp through wet mud up to their knees in order to get to dry land. April in New England is still pretty cold. There were still patches of melting snow on the ground. Since this mission began without notice at 10:00 PM, the men had already been awake for a full day before being called to arms. So before even starting their march, the men were wet, cold, and tired. It took nearly two hours to ferry all the soldiers across the harbor. Because they were not from any single regiment, and because the company officers still had no orders on what they were doing or where they were going, the soldiers collected into disorganized groups on the Charlestown side of the harbor. Col. Smith had to waste even more time assembling the units in proper order for march. Next, the soldiers had to march through more swamps to avoid roads where they might encounter civilians. Some soldiers later reported that they were in water up to their waists. Finally, after reaching dry land, the army had to spend more time waiting for the navy to deliver two days worth of rations to the soldiers for their march. By the time they were ready to march, it was already 2:00 AM. Before they had even left Charlestown, Paul Revere had already reached Lexington, left, and had been captured. Samuel Prescott had arrived in Concord to deliver the alarm. Messengers had already spread word of the march all over the region and militia were on the march to meet the regulars. As the soldiers passed through Cambridge and on the road to Lexington, more and more locals were alerted to the march. As they passed by, more militia units assembled behind the column and began to follow at a safe distance. Col. Smith began to hear gunshots, ringing bells, and other indications that the element of surprise was gone. Fearing this surprise attack would not go well, he sent word back to Boston that they had better start preparing a relief force in case the column came under attack. Once the column reached Monotemy, still about five miles from Lexington and twelve miles from Concord, Smith deployed his second in command, Major John Pitcairn of the Royal Marines with six companies of light infantry and marines. Pitcairn would march his men quickly ahead of the main column. Smith ordered him to secure the two bridges north and south of Concord. The detachment moved forward at the quickstep, making up for lost time. They encountered multiple riders along the road, whom they took prisoner. But it became clear that the entire countryside was now alive with innumerable riders spreading the alarm everywhere. Along the way, Pitcairn’s column met up with the officers who had captured Revere, interrogated him, and released him. 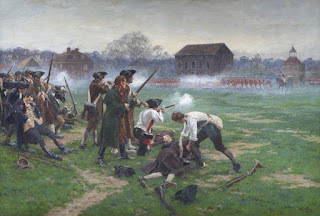 The officers repeated what Revere had told them, that the mission was to seize munitions at Concord, something the junior officers in the advance column were learning for the first time, and that there were about 500 militia assembled in Lexington, armed and waiting for them. Another rider captured on his way from Lexington told them there were at least 1000 militia in Lexington. Though not accurate, the information must have unnerved the men that they might be walking into a trap. Around 4:30, as Pitcairn’s advance column approached Lexington, they encountered two riders ahead of them. One shouted a warning that they should turn back. Another fired his pistol. There are differing accounts as to whether he fired in the air as a warning, or took aim at the column. In any event, he was too far away to hit anyone. But firing the weapon convinced Pitcairn that it was time to stop the column and have the men load their weapons. He also deployed flanking units to make sure there was not ambush waiting for them as they marched into town. Pitcairn’s advance column arrived at the outskirts of Lexington just about sunrise, around 5:00 AM. Both sides greatly overestimated the other. British accounts estimate 200-300 militia still assembling on Lexington Green. Most estimates by the militia seem to put their numbers at 60-70. Similarly, the militia estimated the British force to be 1200-1500 men, when in fact the advance column totaled about 250. 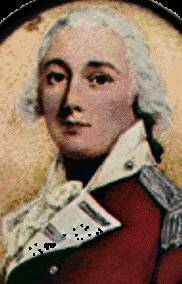 Maj. Pitcairn was bringing up the rear of his advance column while a young Lieutenant named Jesse Adair led the front. Pitcairn had planned to march past Lexington straight to Concord. Rather than remain on the road to Concord, Adair steered the column toward Lexington Green to confront the militia. As the column turned, Pitcairn realized what was happening, galloped forward and rerouted the column along the road to Concord. But the first two companies were already moving with Adair to confront the militia. Before Pitcairn could do anything, they charged forward, nearly running as they quickly assembled into a line of battle. The Regulars began shouting, making it difficult for everyone to hear orders. Witnesses differ on the exact words, but some British officers called the militia rebels and villains and demanded they drop their arms and disperse. 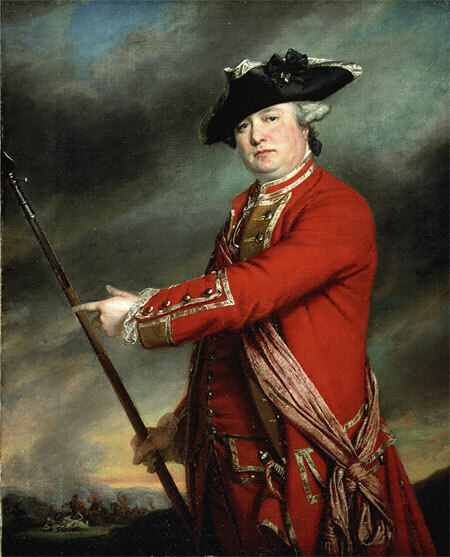 Captain Parker, commanding the Lexington militia, ordered his men to disperse. Some began walking away, but others apparently not hearing the orders or ignoring them, remained standing. No one laid down their weapons..
Everyone seems to have a different account about what happened next. 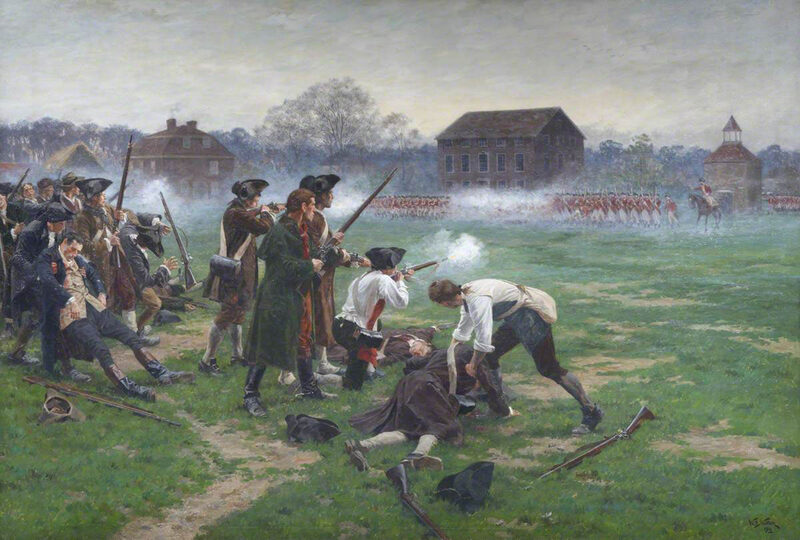 Several militia report a British officer firing his pistol, followed quickly by a ragged volley from the regulars. More accounts seem to indicate the first shot came from a pistol off to the side, either behind a fence or hedge. Paul Revere, who was still struggling to hide Hancock’s trunk in the woods, could not see the encounter, but said he heard a pistol then quickly followed by the volley from the regulars. Although the two lines were probably only 50-70 yards apart, few men fell in the first volley. Many at first thought the regulars might have fired blanks. But they soon realized they were using live rounds, just poor shots. The regulars continued to reload and fire as fast as they could. The militia scattered for cover. A few militia returned fire, but most ran. Most of the casualties were shot in the back while running away. A few were bayoneted. The regular officers lost control of their men, who began charging off in different directions after militiamen, or entering buildings. After about 15 minutes, Col. Smith arrived with the main column. He immediately rushed onto the field, found a drummer and ordered him to beat to arms, the instruction to the regulars to return back to their lines. Within a few minutes, he had restored order. Seven Lexington men had been shot dead. An eighth man, one of the prisoners taken on the road to Lexington was shot and killed while trying to escape. Nine other militiamen were injured. The regulars suffered only one injury, a soldier shot in the leg. Maj. Pitcairn also claimed his horse had been shot twice. Finally, Col. Smith revealed to his officers that the mission was to advance on Concord and seize the supplies there. Many of his junior officers objected, pointing out that they would be marching another seven miles into unknown territory, while the militia, who would now be angered at the attack at Lexington continued to assemble all around them. Smith, however, was determined to carry out his orders and reach his objective. After a few victory cheers, the column continued its march toward Concord. In Concord, a rider from Lexington arrived with the news that the regulars had fired on the militia there. He did not stay around long enough to know if there were casualties, but clearly things were getting serious. 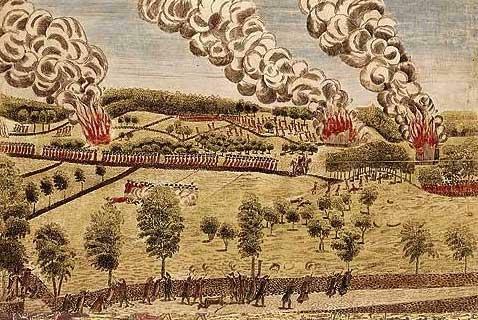 A group of Concord militia under the command of Col. James Barrett, moved out to a hill overlooking to road into town. As the British approached, they spotted the militia and deployed a line of skirmishers against them. The militia retreated in good order before the regulars could get close enough to engage. They returned to town ahead of the regulars. The outnumbered militia decided there was little point in confronting the regulars in town as had happened in Lexington. They retreated north of town, across the north bridge onto higher ground. The regulars marched into Concord unopposed around 7:00 AM. Col. Smith deployed one company of light infantry to secure the south bridge and sent seven companies to secure the north bridge. Four of those companies were tasked to continue about two miles beyond the bridge to Col. Barrett’s Mill. Spies had indicated he kept a large cache of munitions there. The grenadiers remained in Concord, searching those houses and buildings where informants had reported there were military stores. But the people of Concord had received enough advanced notice to hide or remove just about anything of military value. The only weapons found were three cannon. Maj. Pitcairn burst into the local tavern pointed a pistol at the owner, and threatened to fire unless he revealed where they were hiding their weapons. The owner led Pitcairn to three large 24 pounders buried in his yard. After that, Pitcairn released his prisoner and offered to buy breakfast for his men. Beyond that, the soldiers destroyed a few bags of powder and burned some wooden tools. They cut down and burned the town’s Liberty Pole. They also found a cache of lead balls which they dumped in a local pond. The next day, the locals simply waded into the pond, and salvaged the balls for later use. As the regulars burned the gun carriages and other wooden items, they accidentally set a house on fire. The regulars and locals worked together to form a bucket brigade and quickly extinguished the house fire. The detachment of regulars at Barrett’s Mill did little better. Again, the locals had enough warning to remove or hide virtually anything of military value. The regulars forced Mrs. Barrett to provide them with breakfast. Mrs. Barrett fed the men but refused money when offered, calling it blood money. The men threw a few coins at her feet anyway and began to move back to the north bridge. 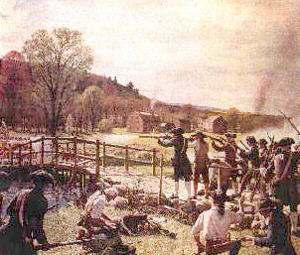 The Concord militia observed events from high ground near the north bridge. As they waited, minutemen from all over the area continued to join them and swell their ranks. Soon they had over 500 men against about 100 regulars holding the north bridge. They also saw smoke from the fire in Concord, and grew worried that the regulars were burning their town. Col. Barrett advanced his militia against the regulars holding the bridge. The two companies of regulars that had taken high ground near the bridge began to retreat back toward the bridge so that all three companies would be together on the other side of the bridge from the militia. The one company at the bridge, however, had set up in a defensive line that made it difficult for the other two companies to cross. The men became tangled in a mess and broke formation. Several regulars then discharged their weapons at the advancing militia, killing two men and wounding four others. Regulars had a disdain for militia, thinking they would often run at the first hint of fire. To their surprise, the militia continued to march forward, maintaining formation. They got within 50 yards of the regulars and opened fire. Many of the militiamen targeted the officers. 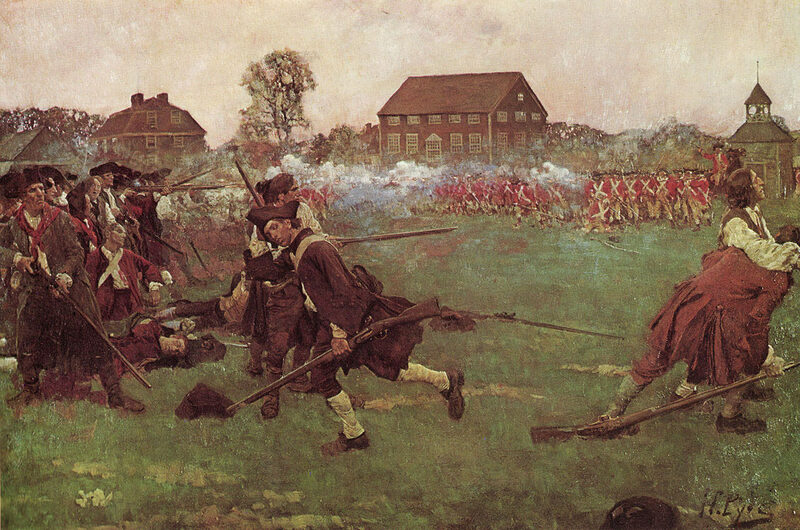 In the first volley, they hit four of the eight officers at the North Bridge. To almost everyone’s surprise, the regulars then turned and fled. They were outnumbered, the enemy fired bravely, accurately, and remained in proper formation. The soldiers fled for their lives, leaving behind their wounded. The militia did not seem quite sure what to do next. Some men advanced on the retreating regulars. Others decided they had given the soldiers a good shellacking and turned around to head home. One young militiaman approached the bridge to find Lt. Edward Thoroton Gould lying wounded but alive on the bridge, abandoned by his men. The militiaman pulled out a hatchet and struck the lieutenant in his head, cutting off part of his scalp and exposing part of his brain. Amazingly Gould survived to tell this story later, though the militia left him for dead on the bridge. Meanwhile, back in Concord village, Col. Smith heard the gunfire as the battle began at the North Bridge. He immediately took two regiments of grenadiers and personally led them toward the bridge. On the way, he encountered the fleeing remnants of the light infantry companies who had retreated from the bridge. Smith pressed forward, with the intention of retaking the bridge so that the four companies returning from Barrett’s Mill would be able to cross and return to the main column. He never reached the bridge though. About 200 militiamen had already crossed the bridge and positioned themselves on a hill behind a stone wall along the road to the bridge. Smith and his grenadiers saw the line of militia from about 200 yards away. The two lines faced one another for about ten minutes, neither firing a shot. 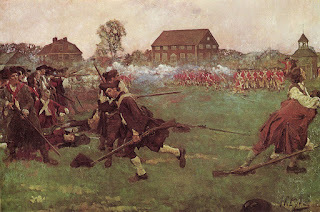 Smith decided his outnumbered men with the inferior ground could not face down the militia. They turned around and went back to town. The four companies of regulars returning from Barrett’s Mill also heard the gunfire and rushed to the bridge, only to find the regulars gone and a disorganized group of militia surrounding the bridge. The regulars marched forward and crossed the bridge, walking right past the militia. Neither side opened fire and the militia allowed the regulars to cross. The crossing regulars saw the wounded Lt. Gould on the Bridge. There was no ethic of “no man left behind” in the British army of the time. They allowed him to lay there, though word of his scalping spread through the British ranks, exaggerated so that word got around that the colonists were torturing wounded soldiers. This story would contribute to further atrocities as the day wore on. 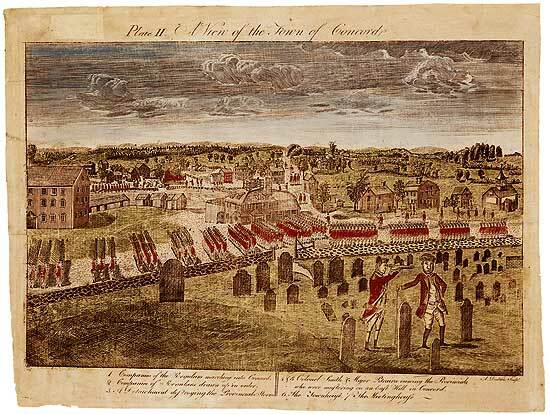 By 10:00 AM, Smith had collected all of his forces back in Concord. He packed the wounded officers into wagons. The walking wounded soldiers would have to keep up. They would leave behind the severely wounded to whatever fate they faced from the angry colonists. All Col. Smith would have to do now is lead his tired, hungry, force of soldiers, who were running low on ammunition on a twenty mile march back to Boston. They would have to pass through a gauntlet ever growing number of angry and heavily armed militiamen bent on revenge. City of Concord Proceedings at the Centennial Celebration of Concord Fight, April 19, 1875, by Concord (1876). Clark, Jonas The fate of blood-thirsty oppressors, and God's tender care of his distressed people. A sermon, preached at Lexington, April 19, 1776. To commemorate the murder, bloodshed, and commencement of hostilities, between Great Britain and America, in that town, by a brigade of troops of George III, under the command of Lieutenant-Colonel Smith, on the nineteenth of April, 1775, Boston: Powers and Willis, 1776. Coburn, Frank, The Battle of April 19, 1775: in Lexington, Concord, Lincoln, Arlington, Cambridge, Somerville, and Charlestown, Massachusetts, Lexington: Self-Published, 1912. Everett, Edward An Oration Delivered at Concord, April the Nineteenth, 1825, Boston: Cummings, Hilliard & Company, 1825. Seeley, O.G. Views and descriptive history of Lexington and Concord, Lexington, W.B. Clarke Company, 1901. Tomlinson, Abraham (ed) The Military Journals of Two Private Soldiers, 1758-1775, Poukeepsie: Museum, 1855. Varney, George The Story of Patriots' Day, Lexington and Concord, Boston: Lee and Shepard, 1895. Fowler, William The Baron of Beacon Hill: A Biography of John Hancock, Boston: Houghton-Mifflin, 1979. * This site is a registered Amazon Associate. Please help support this site by purchasing any of these books, or any other Amazon product, via the links on this site. You can also click on the li nke below to go to Amazon, buy whatever you want, and American Revolution Podcast will get credit for your purchase.